Business premises on South End, vacant as of July 2017. Still vacant as of October 2017 and February 2019 photo. 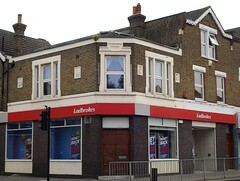 It was previously a branch of Ladbrokes betting shops, but this closed down some time between September 2016 and July 2017. According to a photo on Flickr, as of 1970 the premises were occupied by a branch of Midland Bank (most easily visible at original size). Last edited 2019-02-07 15:02:44 (version 25; diff). List all versions. Page last edited 2019-02-07 15:02:44 (version 25).